In early September senior staff from the NSW EPA Organics Unit were taken on a two-day tour of key organics processing facilities in the region. 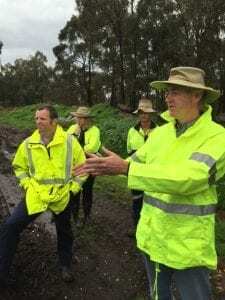 This tour enhanced communication between EPA and council staff; discussed current and planned collection and processing systems, and explored pathways to create increased demand and end markets for compost and mulch products. 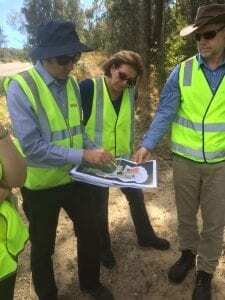 The tour engaged with council waste management staff, as well as representatives from Hunter Local Land Services, NSW EPA and industry representatives. The outcomes are now informing development of a longer-term plan to address recycled organics (garden and food waste) issues across the region. There were many highlights over the two days of the tour, but the opportunity to get ‘down and dirty’ allowed EPA staff to see the day-to-day practicalities and issues at organics processing facilities. The following photos capture the essence of the tour. 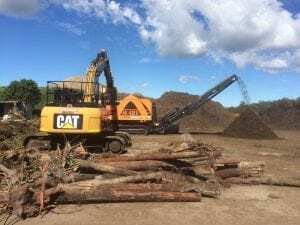 Remondis Project Manager Paul Grime discusses plans for the new organics processing facility at Awaba Waste Management Facility with Amanda Kane (EPA) and Dean Chapman (Lake Macquarie City Council).